Recorded for and recognized as part of 1994's Superunknown, "Spoonman" was the first single (released in February 1994) off the album that went on to sell 5 million copies and put Soundgarden in the woldwide musical spotlight. However, it actually existed much earlier; a brief "demo" version of the song can be heard in the 1992 film Singles. Written by Chris Cornell, "Spoonman" has moved from being towards the end of Soundgarden's live shows to being the opener. It was in fact the first song played at just about every show the band did in 1996 and 1997, with the exception of the June 20, 1996, gig at the Showbox. 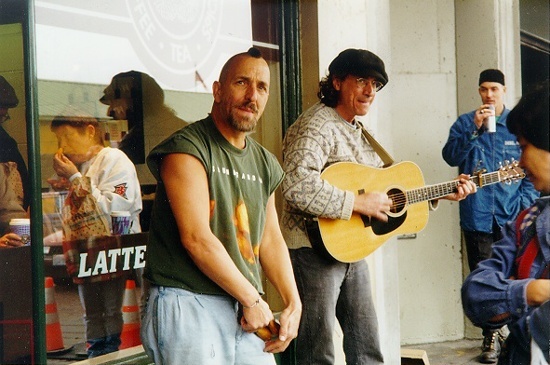 The song is named for and features the Spoonman himself, Artis, a Seattle street musician whose instruments of choice are, yes, the spoons. The photos of Artis in action below were taken by Christy Lopez; clicking on them will retrieve larger versions. The song's origins are confirmed by Kim Thayil: "Chris wrote it during the filming of the Singles movie. 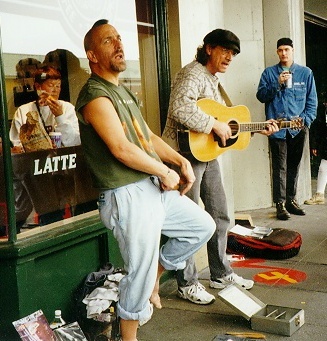 Part of the riff was played on the acoustic guitar and used on the soundtrack to the record. [note: he obviously means soundtrack to the movie, not record, though "Spoonman"'s brief appearance does not appear on the CD soundtrack that was released. -seth] Everyone in the band liked the song and thought it would be great if we Soundgardenized it." According to Guitar World, the song "is representative of the whole album [Superunknown] in that it feels more percussive, with more rhythmic things happening," and Raw magazine calls the track "syncopated, rhythm-driven, forceful genius." One distinctive feature of "Spoonman" is the fact that Ben Shepherd gets a chance to sing backup vocals, which he does through a Fender Twin Reverb ("All my friends are brown and red"). In most cases, Chris sings additional vocal tracks himself. Ben also sings backup when the song is performed live; his own twisted version of the lyrics is available as both an audio clip and a video clip (though the video clip is much longer) below. 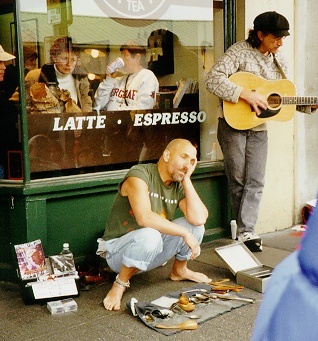 "Spoonman" coincidentally is one of Ben's favorite songs on the record, the one that reaches out and grabs the listener: "That's why I like it," he says. "You know how you listen to a record and there is one song that literally seems to leap out of the speakers -- well, 'Spoonman' did that to me." When asked about the differences between Superunknown and Soundgarden's past efforts, Chris Cornell says: "I think this time around we've written a lot of happy songs. Spoonman is a real cartoon song. Compared to some of our other stuff, it's almost celebratory." 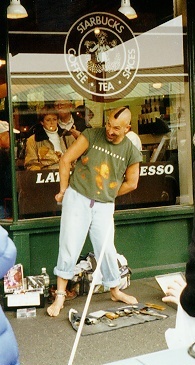 The video for "Spoonman," described in Impact magazine as a "stylish, arty video featuring the jerky dance improvs of Seattle's sidewalk-performing legend Artis the Spoonman," quickly became one of MTV's most popular. About the overexposure, Chris Cornell says: "I think we were fairly smart with 'Spoonman' in that you really don't see us that much in the video. You see various pictures of us, but it's not quite the same as having us in your living room all the time. We're trying to maintain some degree of mystique about Soundgarden, I guess." In August 1994, Steve Fisk's remix of "Spoonman" was included as a b-side on versions of the "Black Hole Sun" and "My Wave" singles. A sound clip is below. Below are some "Spoonman"-related sound clips. If you really want to hear this song's full potential, you have to hear it live. The following are some "Spoonman"-related video clips. All of them were recorded by Geoff Kleemola. The "Spoonman" tablature was worked out by Andrew Northcut; it's a bit too large to fit here, so follow the above link to check it out. Yes, we typically call them bootlegs. No, I'm not going to list them all here. There are a ton of recorded performances that include "Spoonman." Please visit Steve Russell's Soundgarden bootleg discography for details. Thanks to Geoff Kleemola, Christy Lopez, and Steve Russell, Jr., for making this month's page possible.